NEW! Larger size to accommodate the largest laptop computers. Our Laptop Computer Briefcase provides great protection for your take-along computer as well as keeping all of your other daily needs organized. The separate laptop compartment is protected by high-density 3/8" foam. A separate, front compartment is provides plenty of room for extras. Two zippered, flat pockets help organize the small stuff. The 2-1/2" wide, non-slip, padded shoulder strap and palm wrap on the handles make it easy to tote along. 3/8" high-density foam on the back, front, sides and bottom of the laptop compartment. Front cargo compartment. Open, inside pocket in the front compartment. Front, zippered, flat pocket. Back, zippered, flat pocket with protective flap (to prevent wear of clothing). Inside zippered pocket. Seven inside, front organizer pockets. Key keeper. 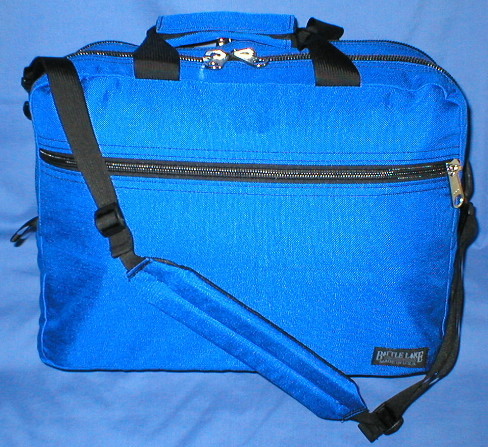 1/2" thick x 2-1/2" wide x 10” long non-slip, adjustable shoulder strap. Palm wrap closed w/ hook and loop. Welded metal trirings to attach the shoulder strap. Made in the USA of American materials. 1000 Denier Cordura outer. 420 Nylon Packcloth lining. #10 and #9 Heavy Duty YKK Zippers. Taped and double stitched seams. ½” EV-50 long-life foam in the shoulder pad. 3/8” high density, closed-cell foam padding. Nexus brand high-strength hardware. Reinforced stress points. Height - 14"; Width - 18"; Depth - 6"
I just received my laptop computer briefcase yesterday. I wa ..